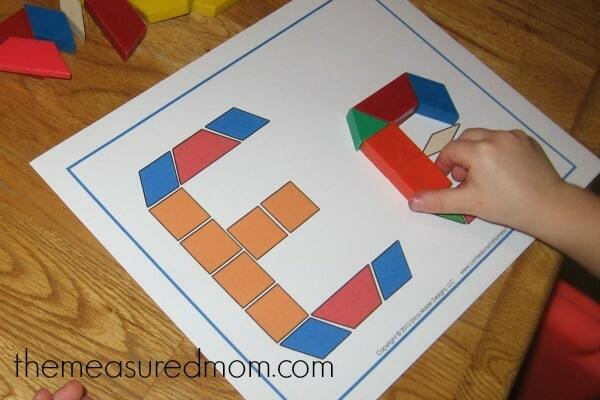 The last two weeks we have been exploring letter E activities. 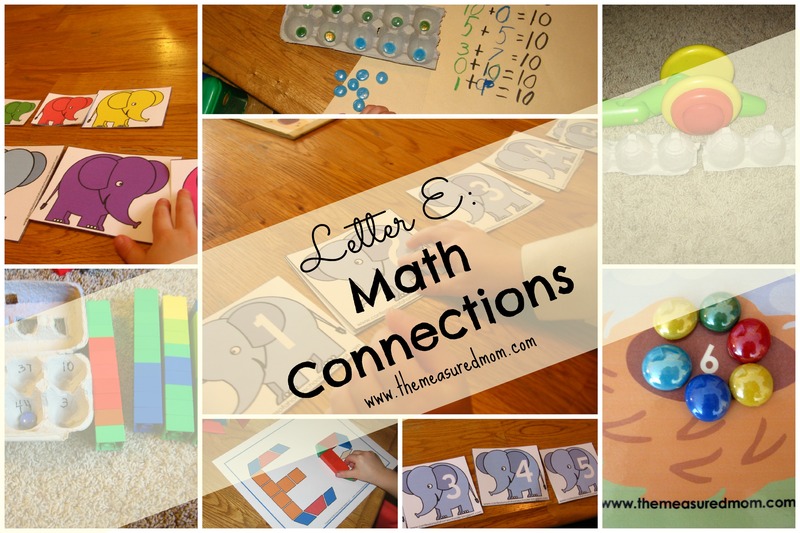 Check out these ideas to support our letter learning and build math skills as well! The kids added brightly colored “eggs” to nests numbered 1-10. My Four and Five did this on their own. My Two enjoyed doing it with me. See my original post here. I printed these from Confessions of a Homeschooler. My Four had no trouble ordering them from smallest to biggest and biggest to smallest. I was surprised at how challenging this was for my Two. Looks like we have more ordering activities in our future! 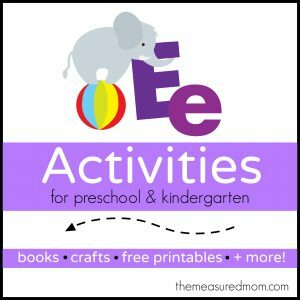 This is such a fantastic idea for nonstandard measurement, and egg cartons fit right in with Letter E. Get the details at The Imagination Tree. I have a set of pattern blocks from my teaching days. You can get these beautiful patterns free from Confessions of a Homeschooler. 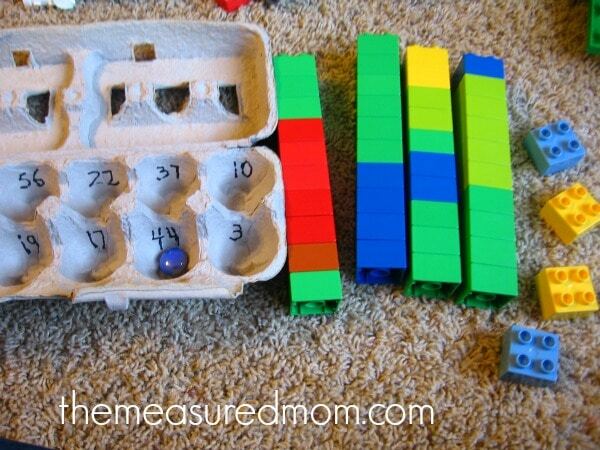 Here’s another idea for egg carton math. 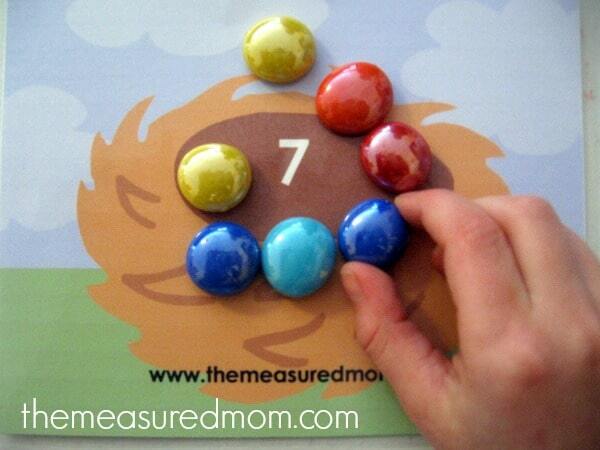 My Four and Five worked together — my Four put in some of his 10 green gems, and his sister filled in the extra spaces with her blue ones. 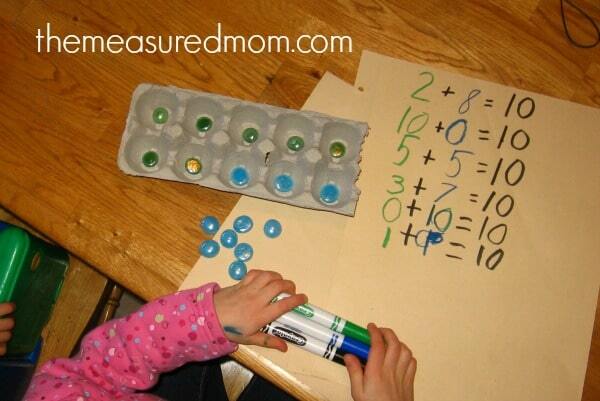 She wrote the number sentences, too. 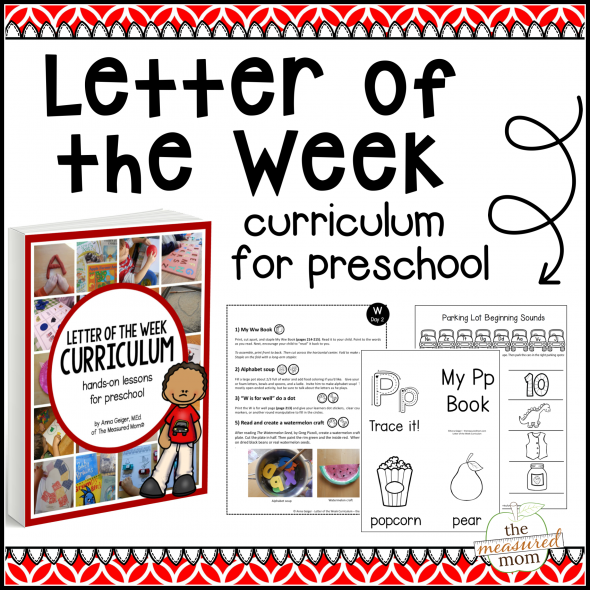 Get the full lesson from Learn with Play at Home. 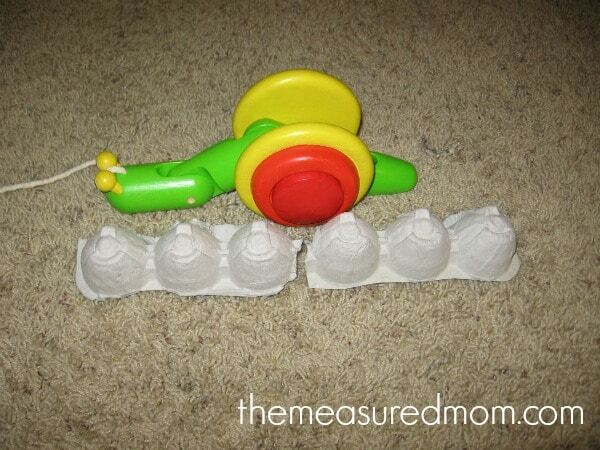 Here’s another wonderful idea from Learn with Play at Home. I love that it’s so versatile. 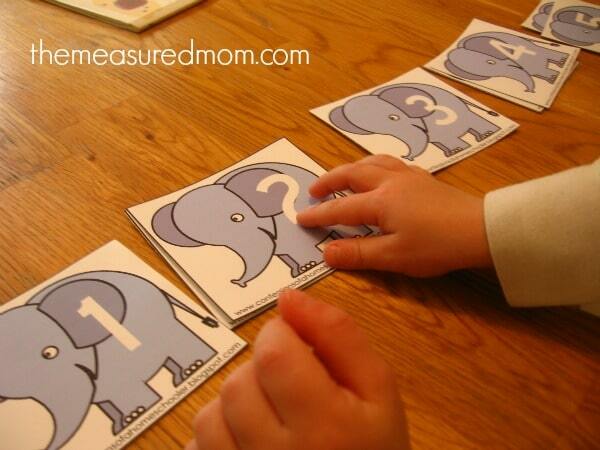 I used this with my five-year-old to help her count by 10’s when forming larger numbers. But you can use it very simply for your Two, Three, or Four. Just make the numbers smaller. For instructions, visit here. 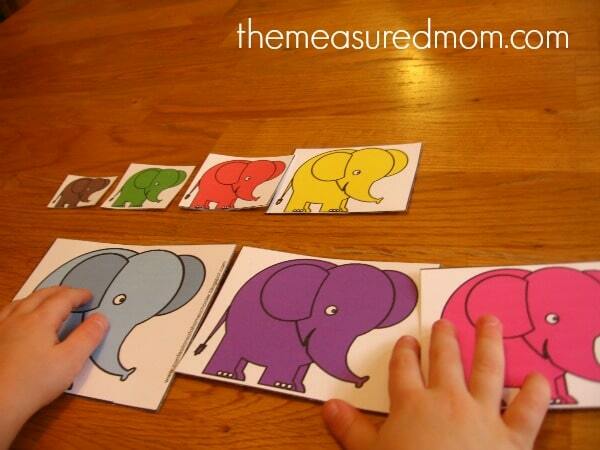 At Confessions of a Homeschooler, she uses these elephants for counting. I used them for number recognition. I printed out two sets and had my Two match the numbers. He only knows a couple of numbers by sight, so this was a way to start reinforcing them. 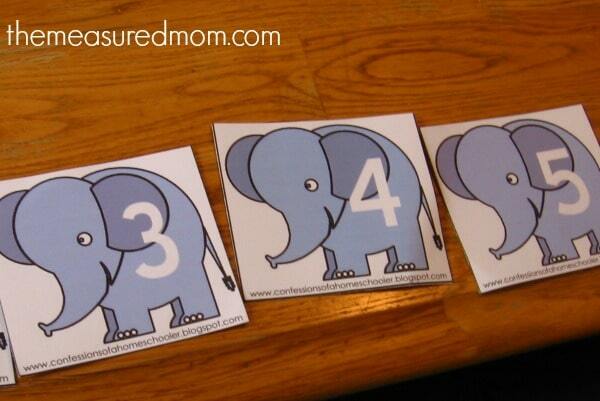 Here’s another way to use those elephant numbered cards from Confessions of a Homeschooler – just put them in order. My Four started by going down from to 1; then he put them in order from 1-10. 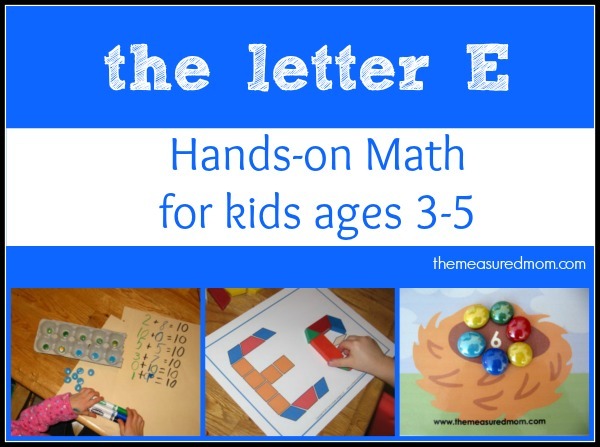 For fine motor, sensory fun, recommended books and more for letter E — click on the image below! Thanks for sharing that with me, Christina! I love the idea of using pom poms. You shared a great variety of activities! I love your site, but always have trouble downloading your activities. Can you tell me how to download from your site. Sorry wrong site. I love your activities though too. You are my go to site, but I am having trouble printing activities from Confession of a homeschooler, not your site. I’m glad you’re getting stuff without trouble here! I think the challenge is that Confessions of a Homeschooler started out on blogspot, so her earlier files were harder to host and now harder to get. If you contact her via her contact form, she can hopefully help you. I did contact her. Thank you for your help. Again I love you site and use it all the time. More work for you, but saves me lots of time. You’re very welcome, Jo – thanks for reading! I’m so glad that you can use my resources, Kay! Thank you so much for your kind comment!